I’m a huge fan of the Icelandic label Lady Boy Records. Most of their previous 10 releases have been cassettes, generally in laser etched cases and in limited editions of 50 copies, though there was also an absolutely killer CD by the band Slugs and some tangerines etched with download codes for a Nicolas Kunysz song. The tangerine is the one item from their catalog that I don’t have, though I’m kind of thankful because I don’t want to know what a nearly two year old tangerine would look like. Needless to say I was very excited when I learned that LB011 was in the works. And even more so when I found it out was a new Ghostigital single. And even more still when I found out it was going to be a record! From there it just got even weirder. Because Lady Boy isn’t going to just put out some 7″ single and call it good. Oh no. How about a 6″ single. And make it square instead of round. On clear plastic. Lathe cut. And for dessert, the B side will be an etching of an original piece of Einar Örn art. My mind was blown on so many levels I couldn’t even see straight. That’s a lot going on for a three-minute single. Needless to say, the second I heard about it I dashed off a note to the guys at Lady Boy and reserved my copy… which just showed up in the mail yesterday, along with the three tapes I needed to round out my LB collection. Forgive the odd looking picture, but this item is hard to photograph! It either ends up with a big reflection problem, or you simply can’t see the etching at all, so my best bet was putting it on my black sofa and taking a picture at an angle. 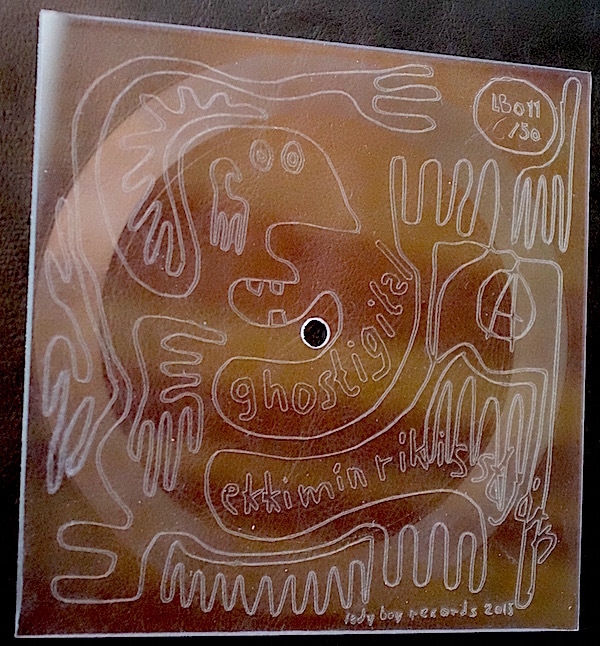 Now any semi-regular reader of Life in the Vinyl Lane has almost surely come across one of my posts about Ghostigital, the Icelandic duo (that sometimes grows to 5-6 members when performing live) of vocalist Einar Örn (Sugarcubes, Purrkur Pillnikk…) and electronics guru Curver. We’ve seen their high-intensity live performances about a half dozen times over the years and they never, ever disappoint. Bottom line is we love us some Ghostigital. “Ekki mín ríkisstjórn” roughly translates to “Not My Government” and is more or less a political protest song, or perhaps more accurately an anti-government, anti-politics song. The song itself has been around for a while now, but was just released digitally back in March in response to some political shennanigans. Iceland’s English language paper, Reykjavik Grapevine, published a piece on it along with a brief interview with Einar Örn. Musically it’s got some great Curver beats with some acidic and cutting electronics to keep you from getting into a comfortable groove, as if such a thing were even remotely possible when Einar Örn is in the room holding a microphone. And since he opens this song shouting “NO!” (“NEI” in Icelandic) about 25 times, the mood gets set early. It sounds like Ghostigital is working on some other new material as well, and I for one can’t wait to hear it. They’re definitely on the right track with “Ekki mín ríkisstjórn.” But don’t take my word for it. You can check it out for free HERE, so make up your own damn mind. NEI! This entry was posted in Electronic, Iceland, Industrial and tagged Ekki mín ríkisstjórn, Electronic Music, Ghostigital, Icelandic Music, Industrial, Lady Boy Records, Music by Administrator. Bookmark the permalink.